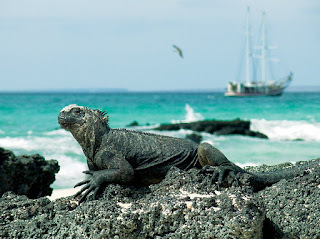 ADVENTURE specialists Explore Worldwide are offering a discount of around $385 on their 17 -day Ecuatoriana and The Galapagos tour departing on April 4, 2012 over the Easter holidays. The package covers the highlights of Ecuador, such as the 5,897 metre active Cotopaxi volcano, canoeing through the Amazon, the trails of Machachi, thermal springs in Banos and a trip in the Devil's Nose Railway before spending a week sailing, snorkelling and swimming through the 'Enchanted Isles' of the Galapagos Islands. The package now costs from $5008 per person twin share and includes 16 nights' accommodation in various hotels, hosterias and boats , 15 breakfasts, eight lunches and dinners, all transportation and the services of a tour leader, drivers, boat crew and local naturalist guide in the Galapagos. Other departure dates through 2012 are available for a slightly higher price. Explore Worldwide holidays are designed as small group exploratory holidays and range in length from eight days to four weeks. They offer more than 450 itineraries in over 130 countries.